Are You Tired Of Struggling To drive Traffic To Your Websites? The internet is changing and evolving everyday. The only way for us internet marketers to stay ahead of the times, is to get with the times and tap into what also works for the future. The future of the internet lies in Social Networking and Social Media. Social Networking Sites have been taking the internet by storm and internet users spend most of their time on sites like Facebook, Twitter, and other sites where they can share information. What better way for an internet marketer to market his business than to tap into the places where most information seekers are hanging out? Social Networking Sites get MORE traffic than the almighty Google! But what is the PROBLEM that most internet marketers have these days? Most of us don't know how to properly brand ourselves and market our websites using all the Social Networking And Social Media sites. Sure, some of us can use Facebook, or know how to spaaaaaaaaam our links on Twitter, but DO YOUR REALLY make money with it? What I am offering you is the complete sollution to your problems. This course is a complete comprehensive ecourse that will reveal everything you need to know to about social network marketing, how to become an instant authority in your field and how to harness the power of social networking sites to become a successful internet marketer that can boost his profits easily. What makes social network marketing different to convensional marketing. The impact of social influence on your online business. Marketing tools that you need to have. Key points that are VERY Important for successful internet marketers. As you can see, I made sure to over deliver with Social Network Marketing Extreme so that your business can benefit to the max. 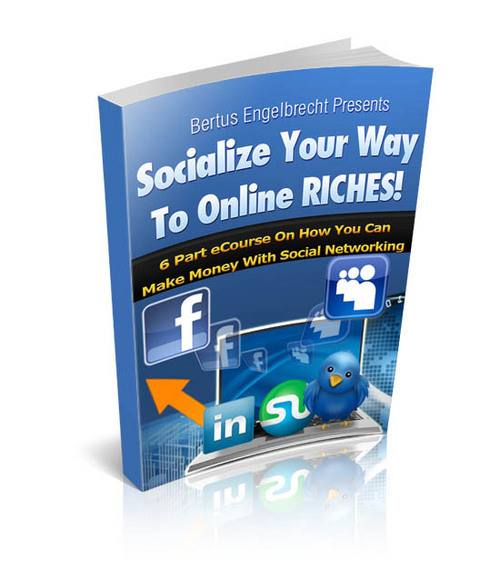 Inside this free course, you will discover what socializing for online riches is and how it can benefit your business. What is social networking and what does it mean for you. Getting to know different social networking sites. Socializing to promote your business. You can easily drive huge amounts of traffic for FREE. Don't struggle with old marketing techniques, you can now become a social network marketing expert and market your products to over billions of users at no cost. Afraid that this will be too difficult for you to master? You don't have to worry, because we tell you everything you need to do. You get all the information you need. It is so simple, even a primary school kid can pull this off. My NEW Special Course "Social Network Marketing Extreme" will open your eyes to the world of social network marketing and will enable you to drive traffic at will. If you dont agree its exactly what you needed, full of handy information that can help you to generate more traffic and make more money using social networks, you can take advantage of my 30-day unconditional Guarantee and simply contact me for a refund! Remember any time at all within the next 30 days even if its in the middle of the night you can ask and receive that refund, straight away. And of course, you get to keep my Special Report with my thanks for taking the time to check out Social Network Marketing Extreme. So just do it discover hidden social networking tips and hints of this powerful revenue-increasing strategy. How much would it cost you to get your hands on this invaluable information that is guaranteed to help you to increase your website traffic and profits? As you have seen, you get a total of 2 FULL products, including a limited time only special 6-day course. All of these are easily worth more than $96. I can probably sell this for $47 easily, but as a special launch bonus I am going to let you legally *steal* the Social Network Marketing Extreme Course and FREE BONUSES for only $37! UPDATE: For a special launch promotion, I am practically giving this product away for a measily $17 for the first 100 people to order. After 50 orders, the price will return to it original price. Download Social Network Marketing Extreme today. Simply click on the "Add to cart" button, below, and youll be reading it quickly within moments. YES! I am in!I want to discover how to skyrocket my internet business by using social network marketing. So please send me my copy of Social Network Marketing Extreme and the HUGE free bonus course. - so I can start generating more traffic and finally making bigger profits, starting today! So lets get started time to hit that download button right now! Click on "add to cart" below to get INSTANT ACCESS to The "Social Network Marketing Extreme" ecourse, and FREE "Socialize Your Way To Online Riches" 6-day ecourse.